Here's Your First Look At Kathryn Bernardo's New Book! What a great way to celebrate the end of your teen years! 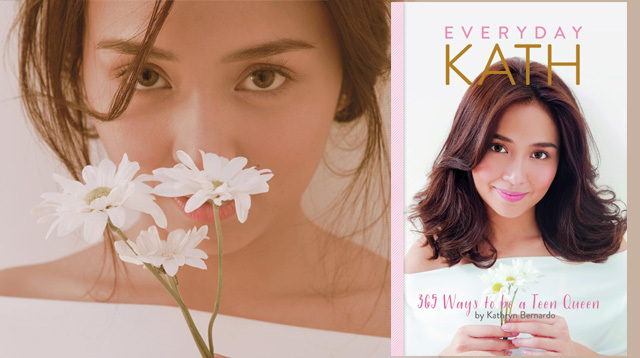 Kathryn Bernardo just turned 20 years old over the weekend (March 26) and she's celebrating the end of her teen years by releasing her very own book, Everyday Kath: 365 Ways to be a Teen Queen. Everyday Kath is not only a celebration of her life so far, but a shoutout to all the young ladies out there who grew up with the actress. It's filled with Kath's lessons on style, beauty, and of course, luuurve! Stay tuned for more updates coming soon! Everyday Kath: Kathryn Bernardo’s 365 Ways To Be Your Own Teen Queen is sponsored by Avon Simply Pretty. The book is out now in bookstores, newsstands, supermarkets, and convenience stores nationwide for P295. For updates and more information, like Summit Books on Facebook via www.facebook.com/SummitBooks and follow on Instagram via @summit.books.